The City of Pittsburgh is thrilled to announce plans for a new Pittsburgh Bike Plan. Since the completion of the City’s first bike plan in 1999, many of the projects outlined in that plan have been installed, national best practices have changed and biking continues to be an important component in many Pittsburgher’s daily routines. Through the implementation of the new Bike Plan, Pittsburghers of all ages and abilities will have a better opportunity to incorporate bike riding into work commutes, recreation activities, daily errand-running, and social events. But before the Bike Plan can be finished, we need to hear from you! Throughout the month of October, we are looking for input from residents, business owners, commuters and, really, everyone who interacts with Pittsburgh’s streets. Follow the link below to tell us how to better connect you to the places you need to go. Through this link you can also get more information about a series of public meetings where you can hear more about the City’s priorities, processes and plan. On September 10th, The Department of Mobility and Infrastructure will host a presentation and discussion with Jeff Tumlin, a nationally recognized expert in the latest land use, parking and mobility trends that influence cities. We are very excited to welcome Jeff to our great city to talk about what these things mean in Pittsburgh. We believe that the event will be of interest to many of you and we hope to see you there! 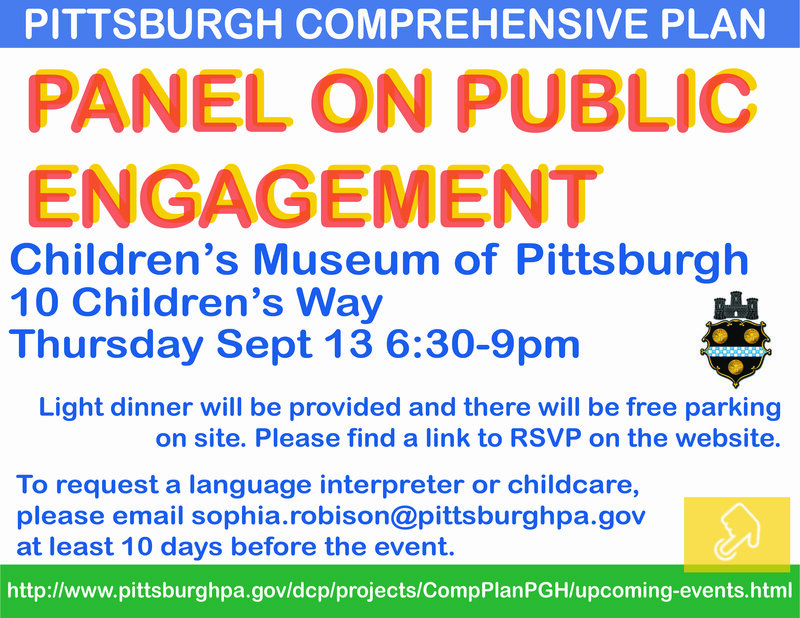 You’re invited to participate in the City of Pittsburgh’s Department of City Planning (DCP) Public Engagement Plan! 1. Please come to the Panel on Public Engagement! The event will occur on Thursday, September 13th from 6:00-8:30 pm at the Children’s Museum of Pittsburgh. Please let us know if you can make it by clicking the button below. Click here for a shareable copy of the flyer to encourage your friends and neighbors to attend. The PEWG will review and renew the approach to public participation in the City’s Planning process. The key focus of this group’s work will be to help the Department of City Planning create a Public Engagement Plan for the City’s Comprehensive Plan initiative. Engagement is key to the next phase of completing the Comprehensive Plan, in coordination with major planning initiatives including the OnePGH Resilience Strategy; the p4 Principles of People, Planet, Place and Performance; and building on public engagement and guidance. To apply, click the button below or fill out this survey: https://arcg.is/11XTTn. The survey will be available until Sunday, August 26th at midnight. On Tuesday, July 18th at 6:00 pm, Councilmen Lavelle and Burgess will be hosting a public hearing to discuss legislation to raise the realty transfer tax by 1%, invest 10 million annually into the Housing Opportunity Fund, and issue a $100 million bond to increase affordable housing. For the full flyer, as well as the number to call in if you’d like to speak (you do not need to call in if you just want to attend) please visit pittsburghpa.gov/cityclerk/schedule. Share your story about why affordable housing is important to you and why you support a Housing Opportunity Fund to #KeepPGHhome! Make sure to sign up to speak by registering on the city’s website or calling (412) 255-2138 by 10:00 am tomorrow! If you sign up you will have 3 mintues to speak, if you don’t sign up you can still speak, but will only have 1 minute. Looking forward to seeing you on Wednesday! Make sure to share the Facebook event after you RSVP to let your friends know you want to #KeepPGHhome!